As the size and concentration of dairy production increases in Wisconsin, so too does the diversity of the workforce. 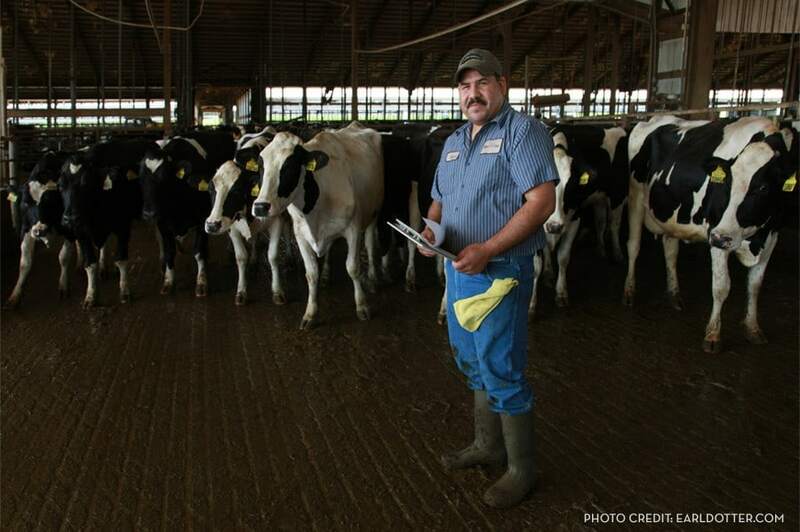 With an increasing number of immigrant, Hispanic workers in the Wisconsin dairy industry with unaddressed language barriers and training needs, culturally and lingustically appropriate education in agricultural health and safety is necessary. The Seguridad en las lecherias project will employ a popular education model that builds on experiential learning approaches relevant to the everyday lives of workers. The goal of this project is to bridge the gap in worker health and safety training in dairy production, by testing a culturally appropriate, occupational safety and health intervention to reduce worksite hazards and to improve knowledge and practices among immigrant dairy workers in Wisconsin. Evaluate the intervention to determine reduction in hazards, changes in knowledge, attitude and practices among immigrant workers and the acceptability of the CAPE methods. The steady increase in consumer demand for dairy products has led to the increase in size and concentration of dairy operations. These large farms bring new occupational risk factors and changes in the diversity of the workforce. It is now estimated that 60% of the milk supply in the US is produced with assistance from immigrant labor, most of which are Hispanic and makes up half of the dairy workforce. These immigrant workers tend to have limited formal education, no training in handling large animals and speak only Spanish. The Seguridad en las Lecherias (Safety in Dairies) project addresses the needs of this vulnerable workforce by designing and implementing a bilingual health and safety training curriculum that is culturally appropriate for Hispanic workers. The training consists of five 1-hour lessons in Spanish with a ‘train-the-trainer’ approach that prepares selected Hispanic workers to become promotores de salud (community health workers) to allow for ongoing support and reinforcement of safety messages after the training is completed. The Occupational Safety and Health Administration (OSHA) has approved the curriculum. This year, the project team along with colleagues from four other organizations was given the Stakeholder Collaboration in Occupational Injury Research Award by the National Safety Council for their work. The training curriculum materials have also been provided by request to over 30 other organizations across the US to train workers outside of this project. UMASH, in partnership with the National Farm Medicine Center and Migrant Clinicians Network, has developed the following video overview of the Dairy Worker Safety Training program. View the video directly on our site by clicking on them below, or download the video by right-clicking the “Download mp4” link below the video and saving the file. Through the Occupational Health Internship Program (OHIP), the National Farm Medicine Center (NFMC) created an interactive Google map of organizations that provide services to Spanish-speaking residents in Wisconsin and Minnesota. This was a project developed to help the farm workers learn about other services that may be available to them. Available in English and Spanish. Migrant Clinicians Network is a national organization with over 30 years of experience addressing the health and safety needs of immigrant workers and their families, assisting workers on farms, at construction sites, and in hotels, nail salons, and restaurants. We bring the clinical perspective into the health and safety conversation, with culturally and linguistically appropriate resources, programs, and direct assistance to help clinicians and health centers address the diverse health needs of their communities’ immigrants and migrants. We also aim to improve the health of immigrant workers by bringing health and safety messages directly to them. The Seguridad en las lecherías project is an award-winning collaboration between MCN, the National Farm Medicine Center and UMASH, which resulted in hundreds of immigrant dairy workers receiving safety trainings. MCN facilitated the promotor de salud or Community Health Worker model to help dairy workers and producers address health and safety on the farm. This model, now common in community health centers and other health settings, trains community members to promote health education. Through this train-the-trainer approach, select dairy workers were trained in key health and safety messages, which they disseminated to their fellow workers. These workers also acted as a liaison between workers and managers to communicate job safety concerns. The project proved effective in reaching an important and vulnerable immigrant community with critical education to keep them safe on the job. Now, we are determining how to bring Seguridad to workers on other farms. One way is to offer the materials for free: the project’s five-lesson curriculum and bilingual comic books are available to download on MCN’s site. The Seguridad project is one of many that MCN has championed in the fight for health justice for the mobile poor. Visit our Environmental and Occupational Health page to hear more about our projects, and subscribe to MCN’s blog to hear updates in the world of migrant health. 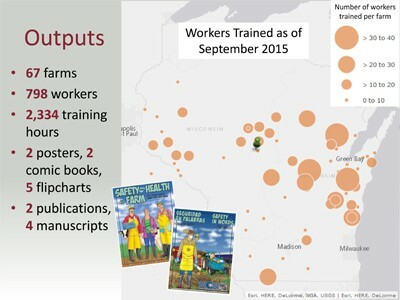 3,453 training hours to 850 workers on 68 farms. Liebman AK, Juarez-Carrillo P, Reyes IA, Keifer MC. A model health and safety intervention for Hispanic immigrants working in the dairy industry. Journal of Agromedicine. Salisbury, Maryland. 2014. Liebman AK, Juárez-Carillo P, Sáenz S, and Guerrero F. COMIC: Safety and Health on the Farm- It’s your Right and it’s the Law. Migrant Clinicians Network, National Farm Medicine Center, and Upper Midwest Agricultural Safety and Health Center. 2014. Keifer M, Reyes IA, Liebman AK, Juarez-Carrillo P. The Use of Audience Response Systems Technology with Limited English Proficient, Low Literate and Vulnerable Populations. Journal of Agromedicine. Wisconsin. June 9, 2014. Leibman AK. Keynote panel speaker on dairy worker health and safety. PA Migrant and Immigrant Health Conference. Grantville, PA. March 29, 2013. Keifer M; Magurany-Brotsk C; Guerrero-Silva F; Ellis T. Development and Implementation of an Agricultural Safety Consultation Program to Protect Dairy Farm Workers. UMASH Annual Forum. Saint Paul, MN. April 17, 2013. Leibman AK. A model health and safety intervention for Hispanic immigrants working in the dairy industry. Minneapolis, MN. September 25, 2013. Reyes I. The use of audience response systems technology with limited English proficient, low literate and vulnerable populations. Minneapolis, MN. September 25, 2013. Juarez P. Sustaining a risk reduction and safe practices intervention model: A randomized controlled study examining the community health worker model in an occupational setting. Safety and Health in Agricultural and Rural Populations. Boston, MA. Nov 2-5, 2013. Liebman AK. A local perspective on a global challenge: Health and safety perceptions and practices of immigrant in workers’ in Wisconsin’s dairy industry. American Public Health Association Annual Conference. Boston, MA. Nov 2-5, 2013. Liebman AK. Designing a safe practices intervention for immigrant dairy workers using a needs assessment and the community health worker model. Midwest Rural Agricultural Safety and Health (MRASH) Conference. Ames, IA. Nov 19-20, 2013. Keifer M and Liebman AK. Workers and Health: How Frontline Providers Make a Difference in the Protection of Migrant Workers and Their Families. EOH Onsite Clinical Trainings for Partner Health Centers. Moorhead, MN. April 22, 2014. Reyes IA, Keifer M, Liebman AK, Juarez-Carrillo P. The use of audience response systems technology with limited English proficient, low literate and vulnerable populations. National Occupational Research Agenda. Minneapolis, MN. May 1, 2014. Reyes IA, Liebman AK, Juarez-Carrillo P, Keifer M. A model health and safety intervention for Hispanic immigrants working in the dairy industry. National Occupational Research Agenda. Minneapolis, MN. May 1, 2014. Keifer M, Liebman AK and Nonnemann M. Dairy Industry Panel: Health and Safety Challenges and Solutions for a Changing Industry and New Workforce. 2014 ISASH Annual Conference. Omaha, NE. June 24, 2014. Pereyra I and Arnold T. Seguridad en las lecherias and workers health and safety on US dairy farms. OHIP NIOSH National Teleconference. Los Angeles, CA. August 4, 2014. Reyes IA, Keifer M, Ninco Sanchez Y, Liebman AK, Juarez-Carrillo P. Migrant workers in agriculture and rural areas – global perspectives and local responses. Safety and Health in Agricultural and Rural Populations. Saskatoon, SK, Canada. October 19-22, 2014. Liebman AK, Keifer M, Ninco Sanchez Y, Reyes IA, Juarez-Carrillo P. Promotor de Salud (Community Health Worker) Model in Agriculture: A local response to a global challenge. 7th International Symposium: Safety & Health in Agriculture & Rural Populations: Global Perspectives. Saskatoon, SK, Canada. October 21, 2014. Juarez-Carrillo P, Liebman AK, Reyes IA, Ninco Sanchez Y, Keifer M. Beyond worker training – the role of the community health workers in sustaining safe practices in an occupational setting. American Public Health Association 142nd Annual Meeting and Exposition. New Orleans, LA. November 15-19, 2014. Liebman AK, Keifer M, Reyes IA, Juarez-Carrillo P, Waring S. All that we herd: Using qualitative methods to understand language, barriers, and challenges in a changing dairy industry. American Public Health Association 142nd Annual Meeting and Exposition. New Orleans, LA. November 15-19, 2014. Juarez-Carrillo P, Liebman AK, Reyes IA, Ninco Sanchez Y, Keifer M. Seguridad en las lecherias and workers health and safety on US dairy farms. Midwest Migrant Stream Forum. San Antonio, TX. November 19-21, 2014. Keifer M, Ninco Sanchez Y. English as a second language. Agricultural Safety Connection Complimentary Education Seminar. Stevens Point, WI. January 8, 2015. Sánchez YN, Liebman AK, Juárez-Carrillo P, Reyes I, Keifer M. Culturally appropriate health and safety intervention for immigrant workers in dairy. 2016 Nora Symposium, May 4, 2016, Minneapolis MN.